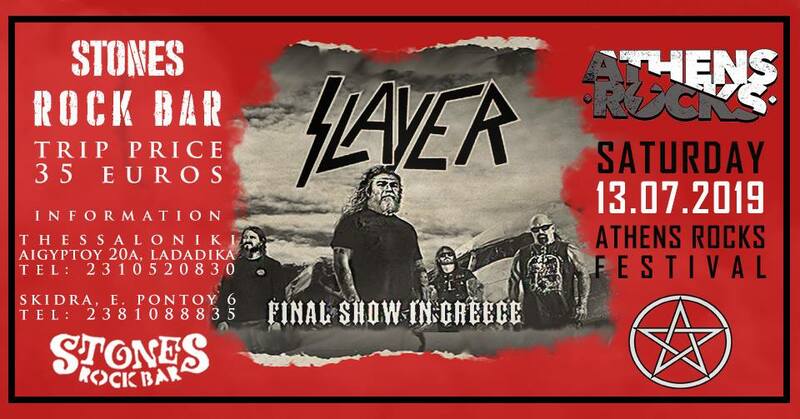 Slayer – AthensRocks Festival 2019 Concert Trip. AthensRocks Festival is recommended to the Greek public with a band that does not need any recommendations… Slayer is back in town! As part of their latest world tour, Slayer is coming to Greece to say hello to the Greeks too! July 12, 1996. The legendary Rock of Gods brings the thrash metal leaders for the first time in Greece. and this time gives the Greek audience the opportunity to see them in their final show! After 37 years, the band who wrote in golden letters his name in the book of metal music, hangs his guitars.